Extra Shot Coffee Mug Livens Up Your Mornings | OhGizmo! We’re not sure how your boss is going to feel about it, but we certainly think that walking around the office with the Extra Shot Coffee Mug will make you the envy of your coworkers. After all, who hasn’t thought of spicing up a Monday morning with a little shot of pick-me-up in their coffee? 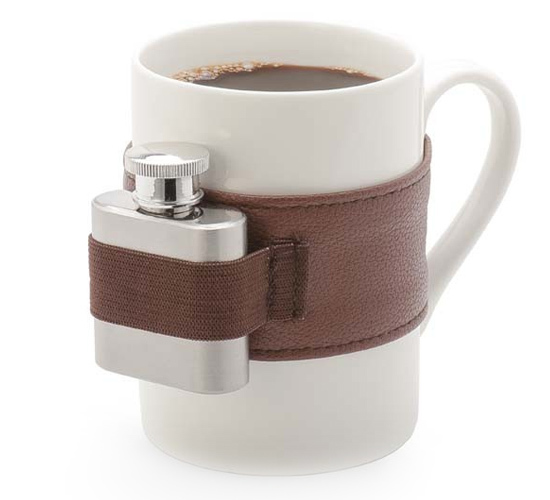 The leatherette strap carries a tiny flask for the libation of your choice, while the mug itself appears to carry a standard size of American style Joe. It’s $15.